When something good happens, travel to celebrate. If something bad happens, travel to forget. If nothing happens, travel to make something happen! Monday, April 18, 2016: Departing Moab, Utah at 1015 hours under mostly sunny skies and a temperature of 55 degrees. Well, so this morning Kit and I decided to hop on US-191 and head south because what more inefficient way to head to our home in New England than by driving south!?!? An hour later, we pulled off for fuel in Monticello, Utah. Back underway and with a destination in mind, we headed east on US-491 and crossed into the state of Colorado in the early afternoon. 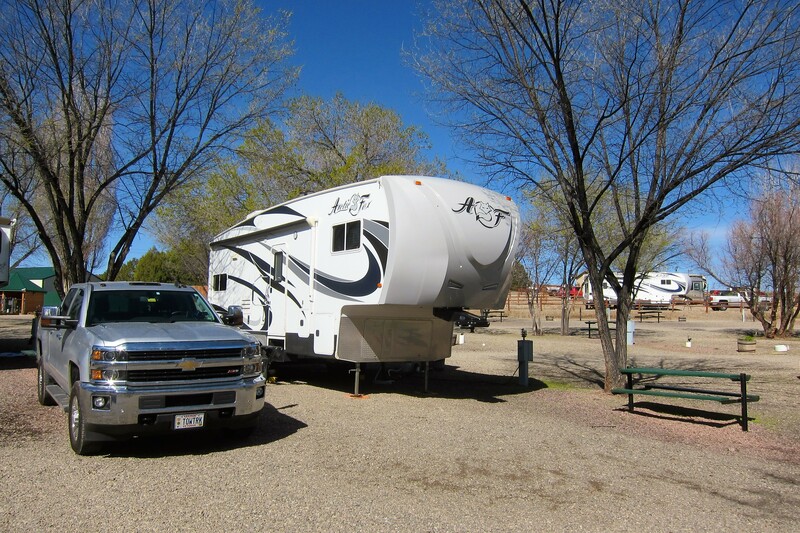 Then, in an hour or so we arrived in the town of Cortez where we located a nice campground just east of town. It’s hard to tell, but in the background of the photo above there is a truck and trailer to the right that is identical to our rig…kind of a camper photobomb! Upon pulling into our site, we exchanged waves and had intentions to walk over and visit at some point. But alas, during our stay either they were gone or we were gone and the Arctic Fox reunion never happened!?!? 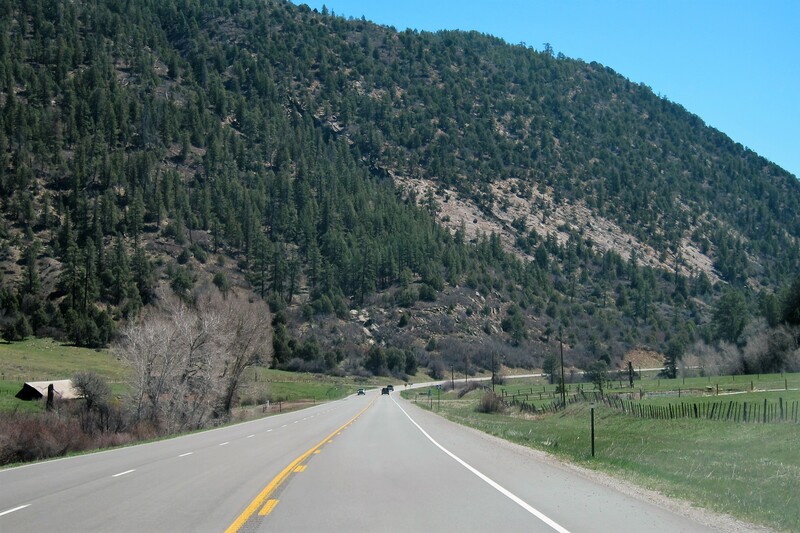 So, why only travel a few hours, and why stop in Cortez, Colorado? Well, two reasons, an old shipmate of mine is reported to be living in these parts, and secondly Cortez is the location of Mesa Verde National Park! Larry and I served on a US Navy Frigate out of Norfolk, Virginia that was overhauled at Maine’s Bath Iron Works in the mid 1970’s. He left the Navy when his enlistment was up then headed home to Colorado and we haven’t seen each other in forty years! A quick internet search turned up his name and a spontaneous phone call surprised the heck out of him! Fortunately, he and his wife Vikki were available to meet us for dinner that evening, so we convened the reunion at La Casita Cortez, a nice Mexican restaurant. Kit and I had a wonderful time visiting with them and catching up on the past forty years. Larry and Vikki invited us to their home in a few days, an offer we readily accepted. 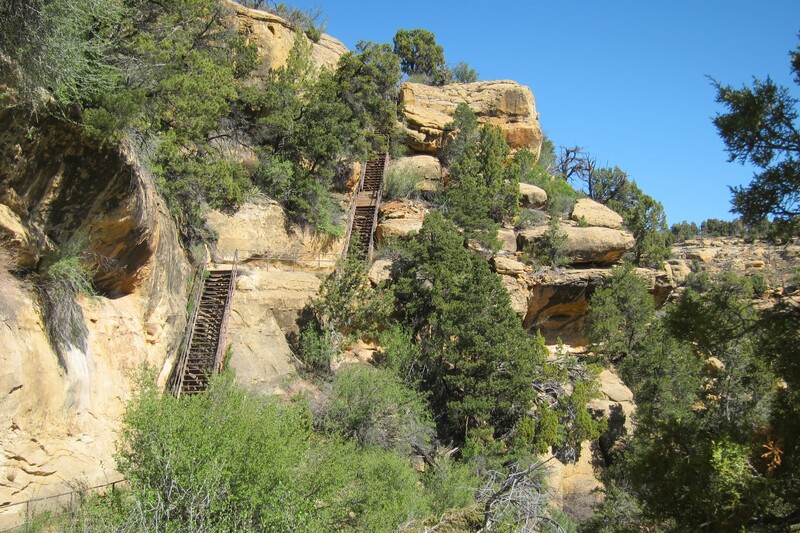 Tuesday, April 19 and Wednesday, April 20, 2016-Cortez, Colorado: As mentioned, Mesa Verde National Park is a short distance away from our campground and Kit and I spent most of two days exploring this unique park. As usual, we stopped at the visitor’s center, in this case a brand new facility with state of the art systems and interpretative displays, videos, and ranger led discussions. 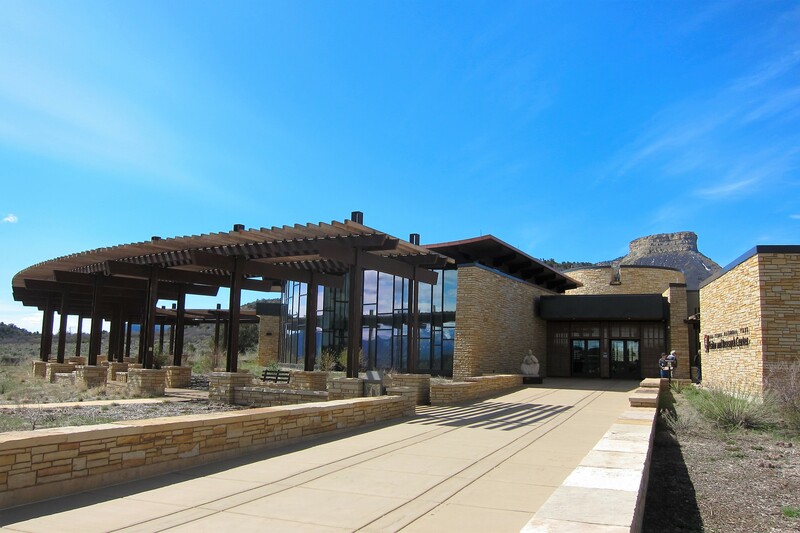 This is one of the nicer National Park visitors centers we’ve come across, of course it helps that it is new and has been very well thought out and staffed. There is a large climate controlled storage room containing thousands of artifacts found in the region. 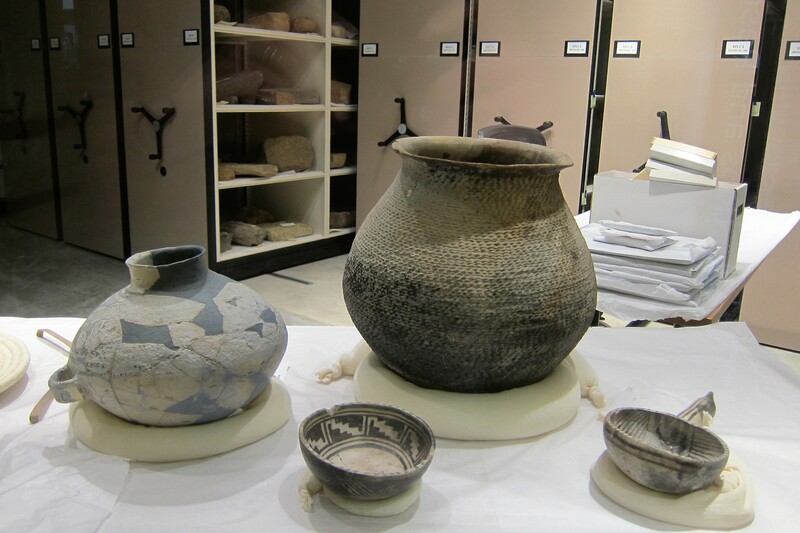 These items are made available to scholars and researchers, however there are viewing windows available so the public can see some of the collection and observe what is going on inside the vault. Picking up brochures and maps, then scheduling a few guided tours into the ruins, Kit and I headed up the access road to enjoy the sights. 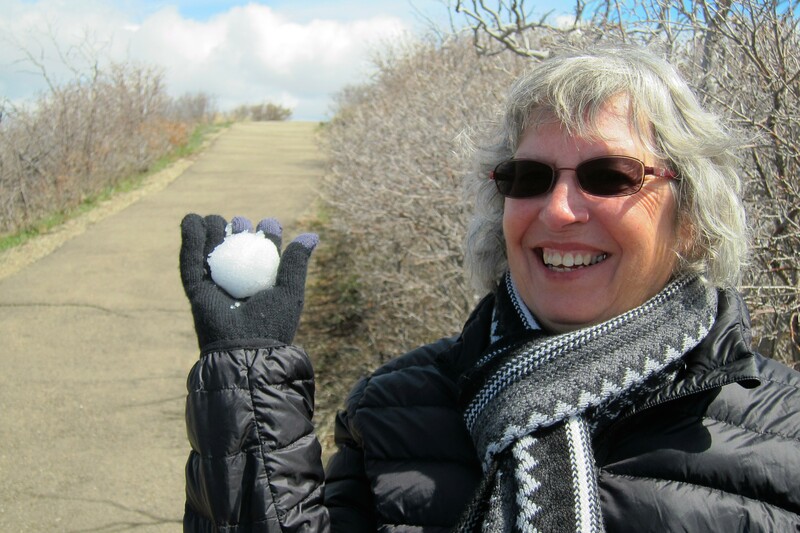 The higher we climbed, the colder it got, and we soon started noticing snow clinging to the north facing slopes. At one of the pull outs, we stopped to play. 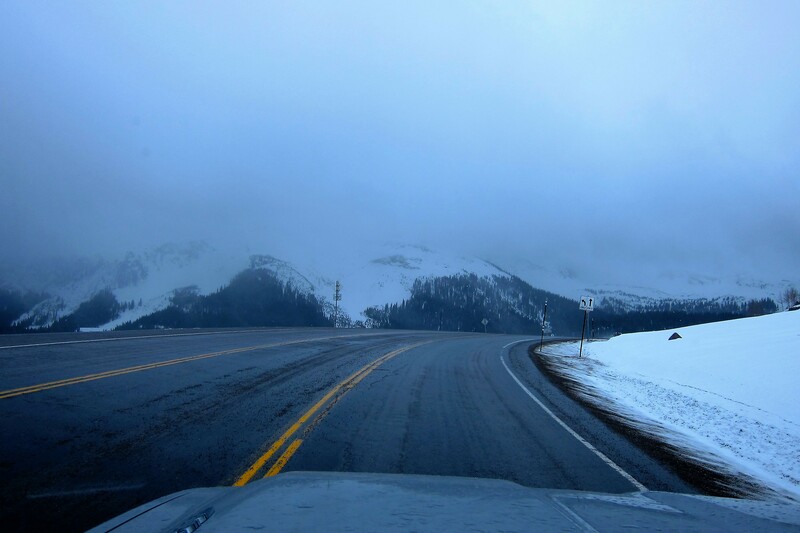 The altitude was 7,323 feet and the temperature is 45 degrees, so the winters snow will hang around for a while longer. 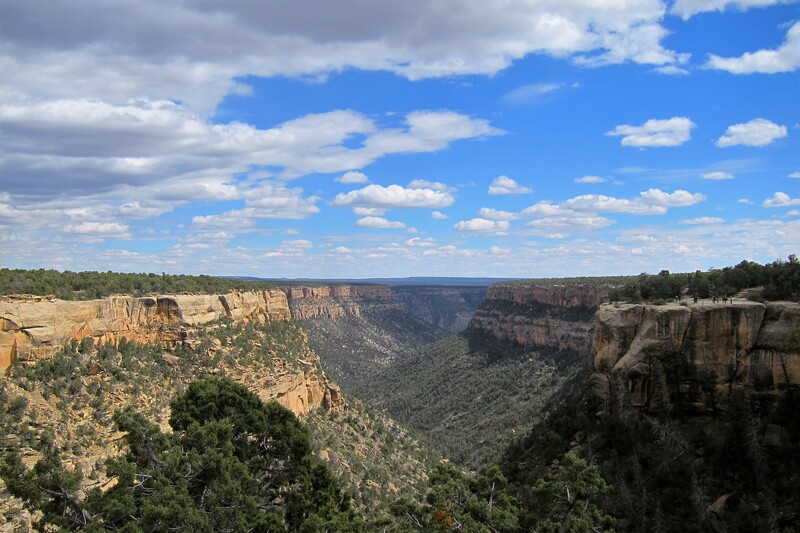 Mesa Verde National Park was established by Theodore Roosevelt in 1906. The park is also classified as a World Heritage Site…of the 1,031 designated sites in the world, only 23 are in the United States. This honor bestowed by the United Nations is in recognition of the significant cultural value within Mesa Verde. 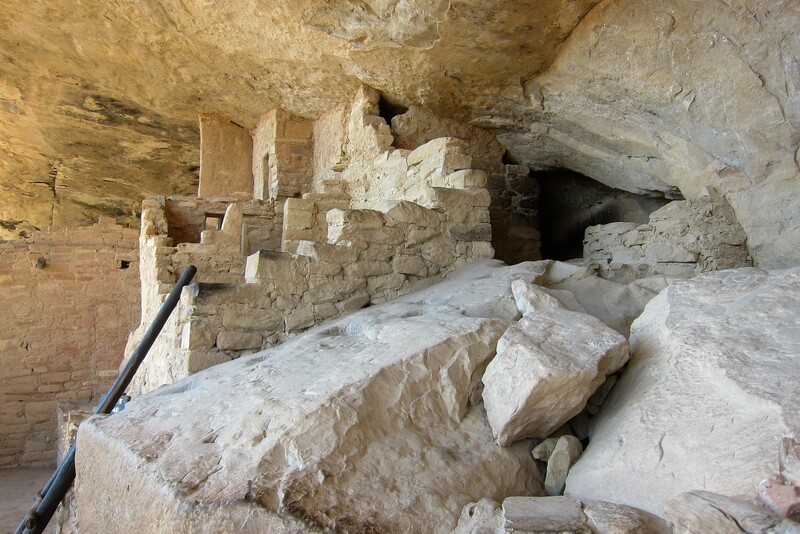 The park features over 4,300 archeological sites including 600 cliff dwellings. 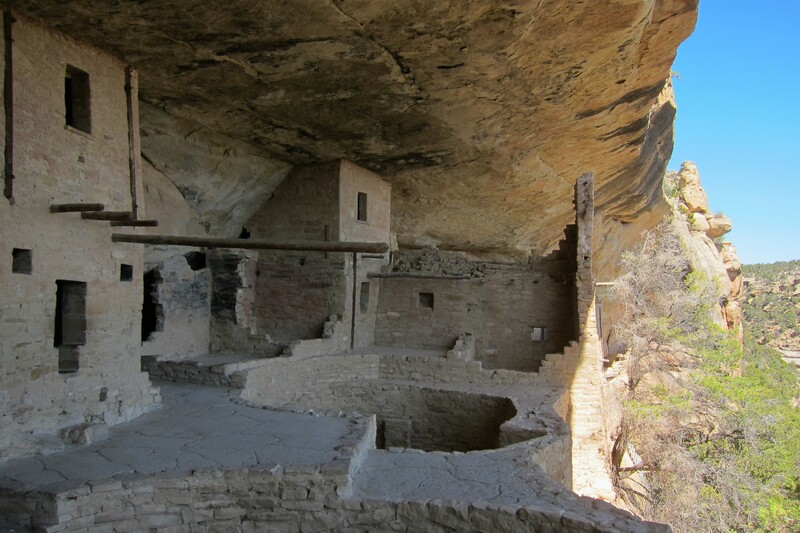 Early native peoples inhabited the Mesa Verde (Green Table) as early as 1,500 BC and were primarily hunter/gatherers and subsistence farmers. 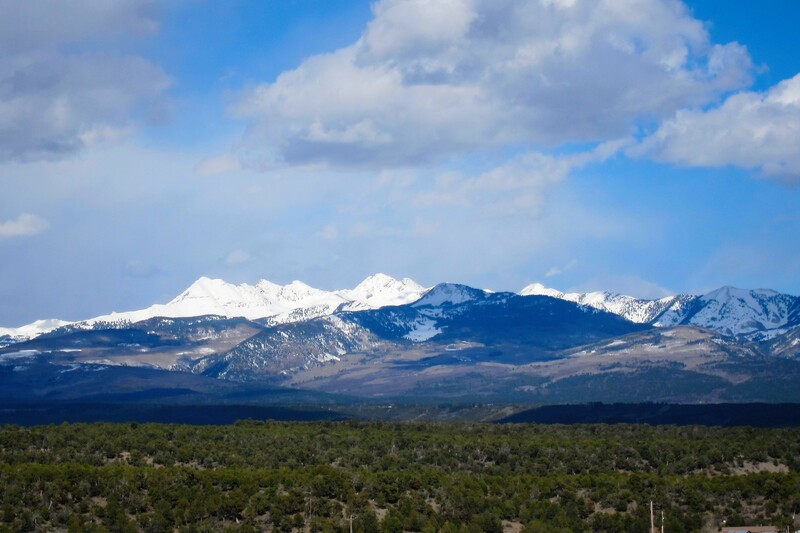 The lush mesa tops were ideally suited for agriculture as the terrain sloped gently to the south providing ample sunshine and water by way of rainfall, further augmented by snow melt from the nearby La Sal Mountains. As you might expect, there are many examples of native presence on the mesa. 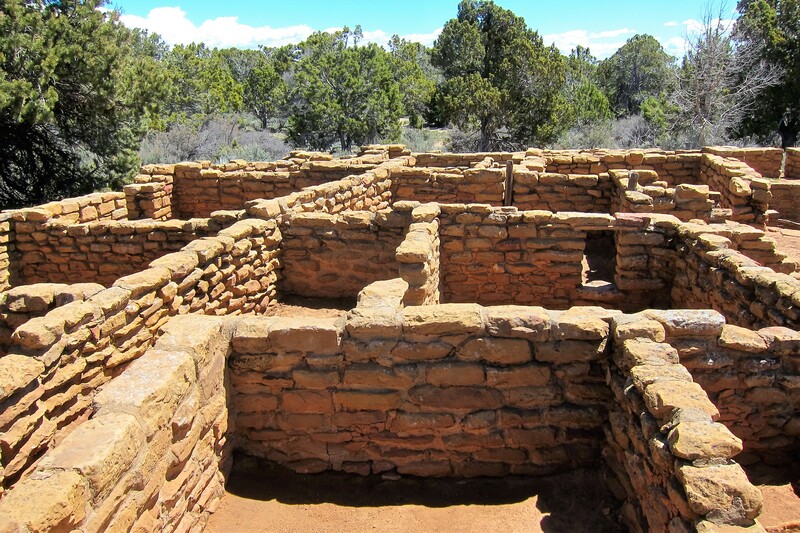 Currently known as Ancestral Puebloans, most lived in large pueblos built by the earliest inhabitants on the mesa. 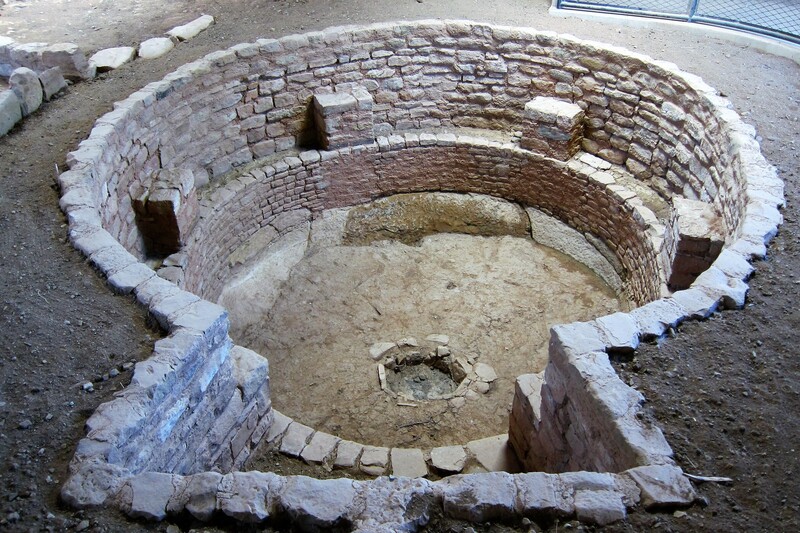 As many as dozens of multi-generational families lived in these pueblos which contained separate rooms, communal cooking and worshiping areas, and grain storage bins. Building these structures was tedious and time consuming so many family rooms were built in a grid with doorways in alignment to allow the family in back to access their room by walking through the family’s home in front. This elimination of hallways saved a lot of time and effort during construction…you wonder however how it worked if there was conflict within the tribe? Essential water for the tribe’s use and for irrigating crops was collected in large hand dug catchments with stairs and ramps built into the rock wall for easier access to the water. Within, or nearby, the pueblo are underground rooms called Kiva’s which are used for spiritual ceremonies and sometimes as a social gathering place for the tribe. 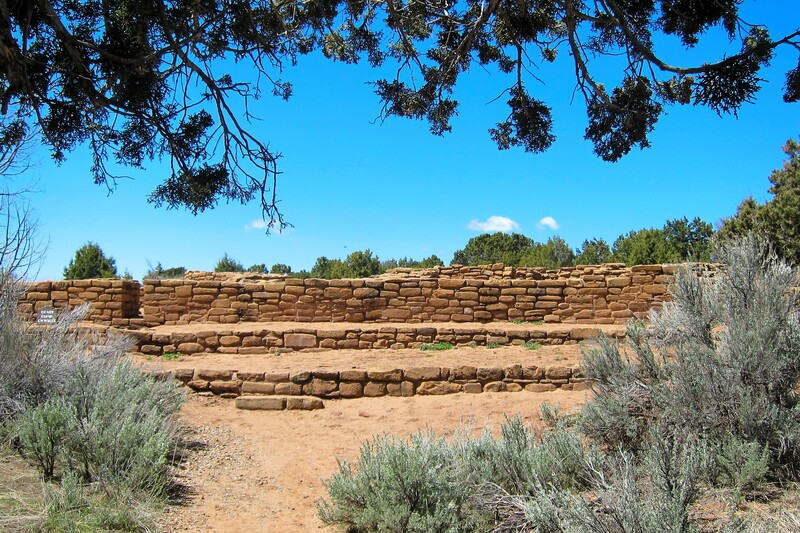 Most Native American peoples utilized Kiva’s but the Ancestral Puebloans were unique in that their Kiva’s were keyhole shaped…why, no one knows. Missing from the Kiva above is the roof which would have been made from wooden beams and thatch. 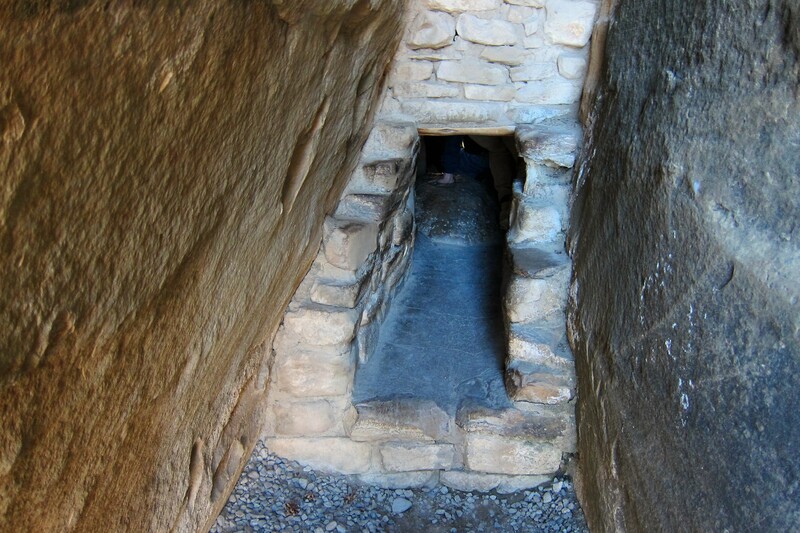 The hole in the floor is called a Spirit Hole and is how the living would communicate with their ancestors. They must’ve expected where their fore bearers would reside in the afterlife otherwise the spirit hole would have been in the ceiling! A quick note about the name “Ancestral Puebloans”. As a youngster growing up in the San Diego City School System, we knew this tribe as the Anasazi. However, that name came from the Navajo Indians as a derogatory term which meant “Ancient Enemies”. The Native Peoples who currently call the Colorado Plateau their ancestral land prefers to be called Ancestral Puebloans. 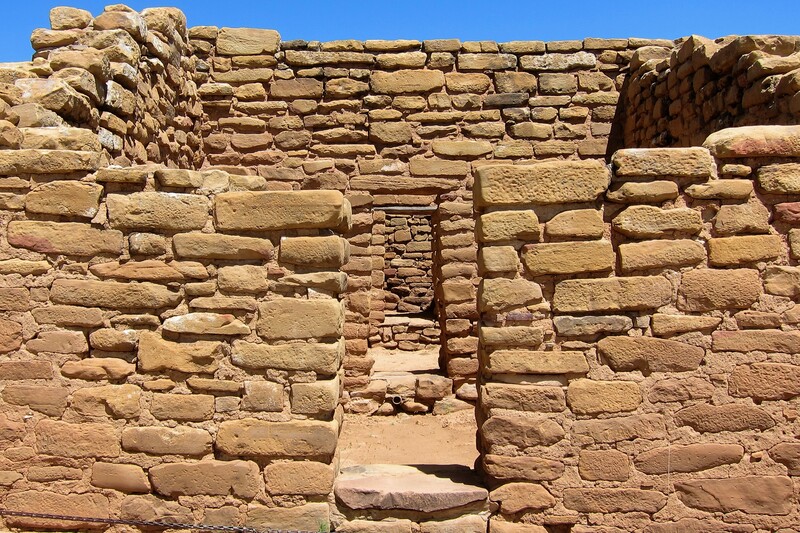 In the twelfth century, the Ancestral Puebloans that inhabited this region suffered from climate change which affected their food supply and therefore their viability. 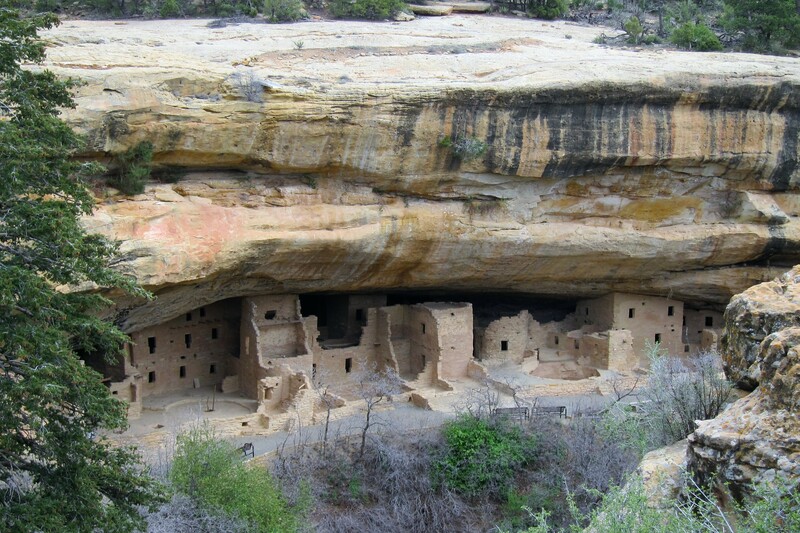 This brought about regional instability and caused outside tribes to move into more fertile lands such as Mesa Verde. The influx of these alien tribes caused strife amongst the Ancestral Puebloans and the resultant conflict forced them to abandon their mesa top pueblos and relocate into cliff-side alcoves and rock overhangs. 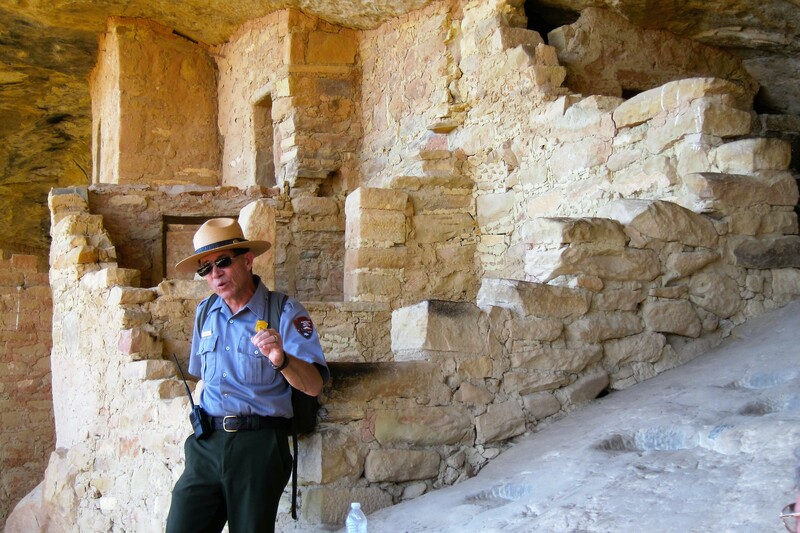 The park service leads visitors on various tours of the cliff dwellings of Mesa Verde. One that I enjoyed was a climb down into a ruin known as The Balcony House. 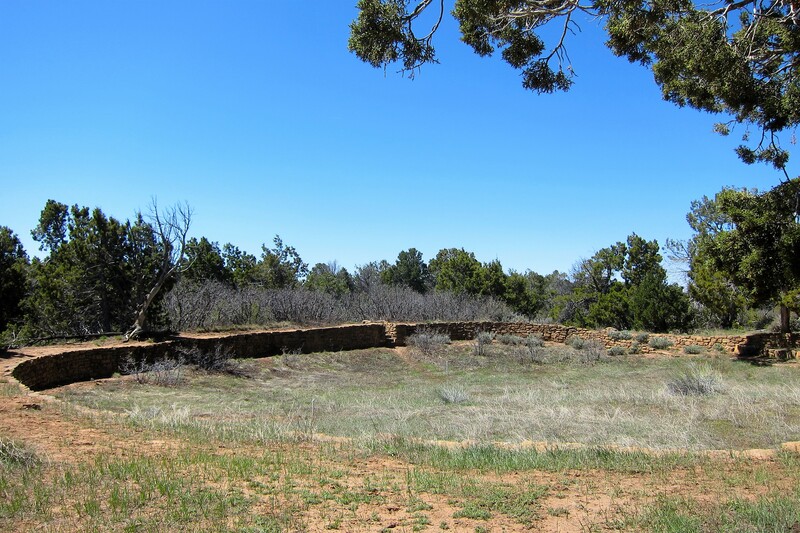 Balcony House is set on a high ledge facing east and just a short vertical climb to the mesa farmlands. Remnants of the Balcony Houses 45 rooms and 2 Kivas are very well preserved and the ranger spent quite a bit of time explaining the life of the people that resided here 700 years ago. Of course the same difficulty of access that the native residents used for protection, causes todays tourist a challenge as well. To begin with, there is a steep descent down stairs to reach the rock face alcove. Then to climb into the dwelling itself, one has to scramble up a traditionally built 32-foot ladder. Once inside the dwelling, it is amazing to see how the native builders adapted each room to the contours of the existing rock alcove. One can really appreciate how the folks that resided here felt secure…and the views are not too bad either. The modern tourist has to contend with the way the Ancestral Puebloans designed their fortified homes. Moving from area to area requires a scramble along narrow unprotected ledges or crawling through very tight stone tunnels. And if that wasn’t enough of a challenge, the route back onto the mesa required utilizing the original footholds in the almost vertical rock face. Fortunately, as you can see, the park service has provided a bit of protection in the form of chains and catch-nets. 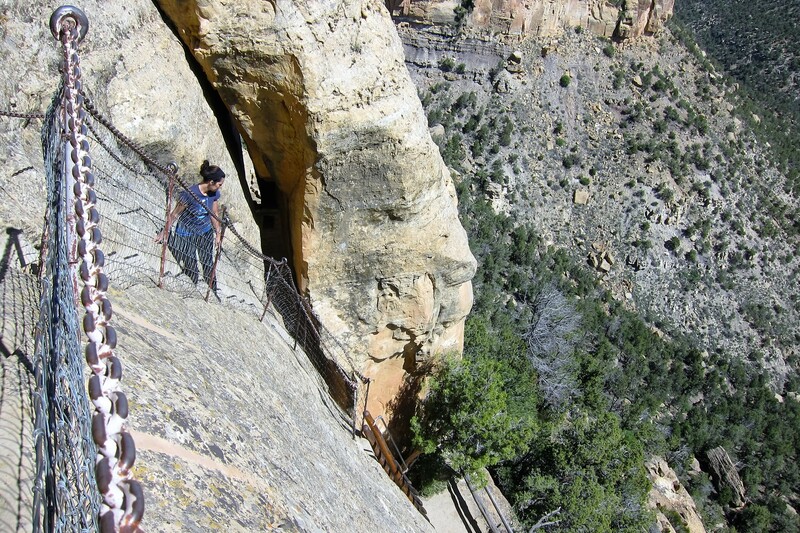 The path wasn’t as long or treacherous as the scramble up to Angels Landing in Zion National Park, but it was a bit unnerving nonetheless. Safely back on level ground, everyone agreed it was a great tour and highly worth the effort…I would highly recommend any of the tours into the cliff dwellings of Mesa Verde on your next visit! Whenever Kit and I spend the day in one of our nations National Parks, we usually treat ourselves to a nice meal in their historic hotels or dining facilities. 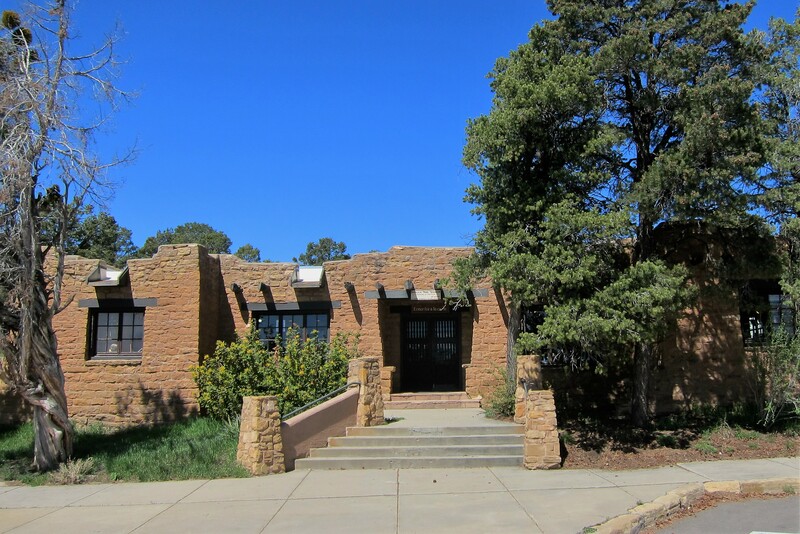 Since it was early in the season at Mesa Verde, these facilities were closed. 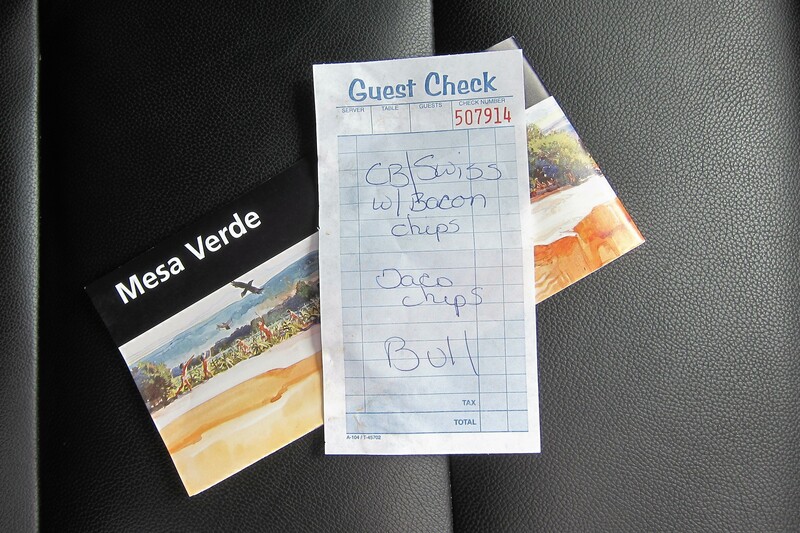 So we stopped at the nice snack bar located near the parks southern visitors complex at the far end of the park road. These modern buildings were designed in the style of the pueblos and blended in more effectively with the surrounding terrain. As I was trying to decide what to order, I knocked over the menu board and received some good natured ribbing from the lady at the counter. Kit and I got our drinks and found a nice table to await our food. Soon the loudspeaker bellowed “Bull, your order is ready! There were chuckles throughout the cafeteria, and the cashier was laughing hysterically! Then later, when I stopped by the place to grab a cup of coffee, I was greeted enthusiastically by the cafeteria crew by my new nickname! 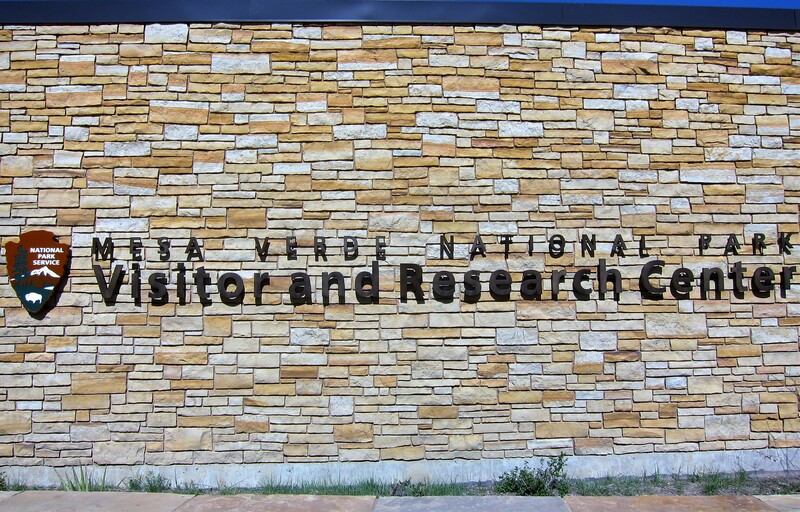 Now a quick comment about the last time we visited Mesa Verde National Park. It was forty-two years ago during a three week camping trip throughout the Western United States…Kimber was nine, Joe was seven, and Suzie three. Back then visitors to the National Parks were encouraged to walk about the ruins and really experience life as our forefathers, and foremothers, did. Today, rightfully so, there are signs everywhere forbidding the touching or climbing on any part of the historic structures. 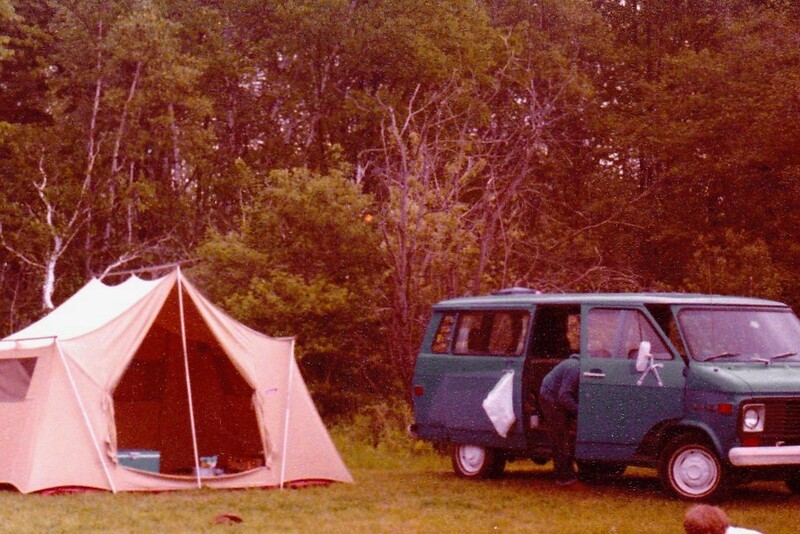 Also in 1974, accommodations were a bit more rustic than Kit and I enjoy today. Over the years we have tried to expose Kimber, Joe and Suzie to the joys of traveling to America’s fantastic natural places. There were times when the kids were asked at the beginning of the school year what they did on their summer vacation. After describing all the places, they had traveled to and the things they had experienced, their classmates thought they were fibbing!?!? 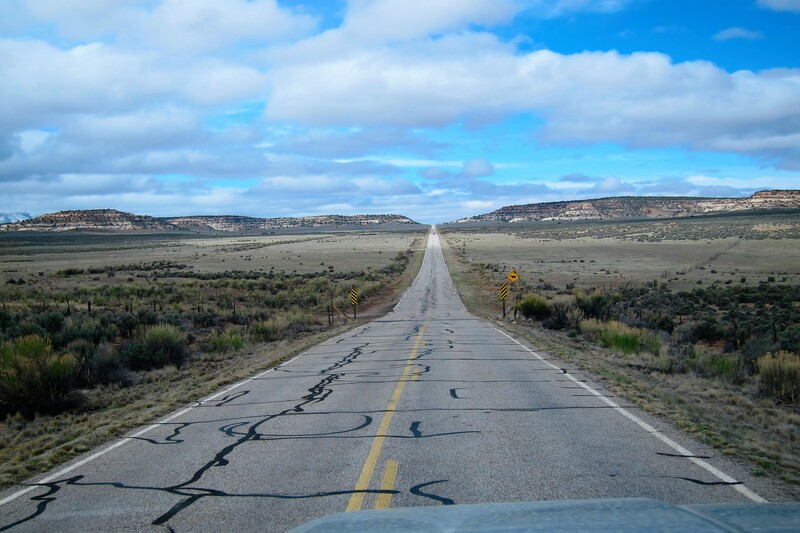 Tomorrow we pull out of Cortez, Colorado…but once again our “Bucket List” does not shrink as we intend to return to this area and explore some more on future Excellent Adventure trips. Thursday, April 21, 2016: On the road again under clear sunny skies. The temperatures are in the 70’s as we continue east on US-160 through the Mancos Valley of Colorado. Within a very short time, Kit and I arrived in Durango and decided to stop for a few days…at this rate, we may never reach the East Coast!?!? 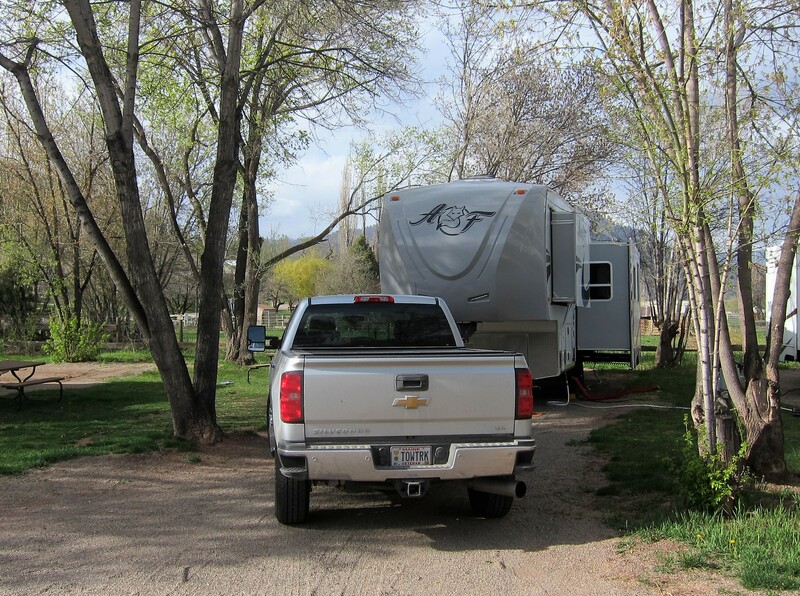 Driving a few miles north of town by following the Animas River Valley we arrived at the small berg of Trimble Springs where was a nice little campground. After setting up the rig, Kit and I enjoyed a nice camper cooked meal and made plans for our stay in the area before retiring for the evening. 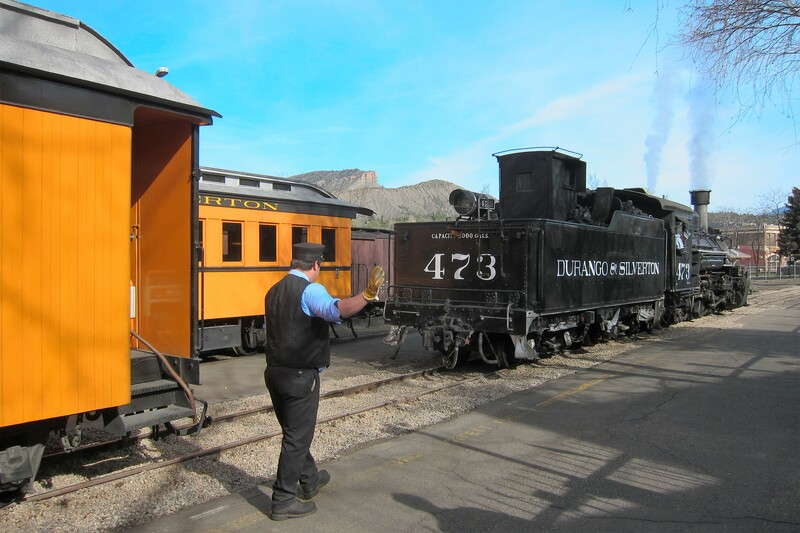 Friday, April 22 and Saturday, April 23, 2016-Durango, Colorado: The town of Durango sits at 6,512 feet of elevation and was established in 1881 as a railroad stop by the Denver and Rio Grande Railway. 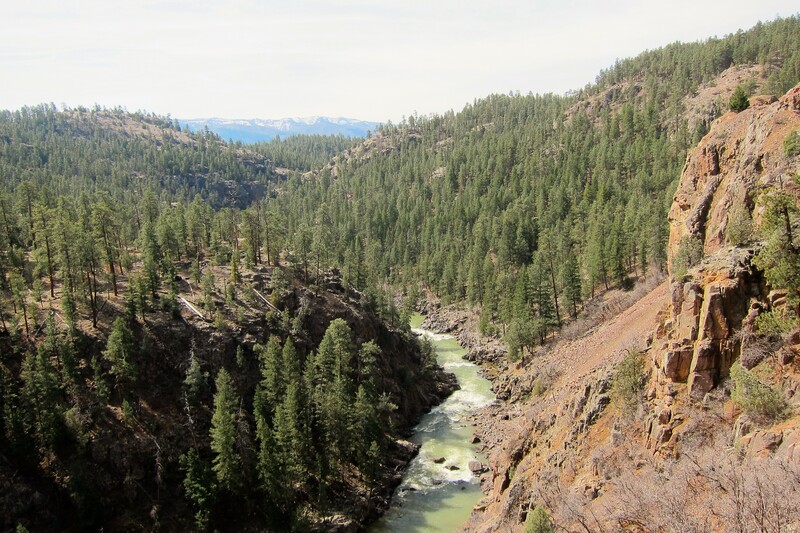 With a year-round population of just under 17,000 folks, it has become an outdoor recreation mecca for hiking, biking, kayaking, fishing, rock climbing, and various winter sports as well. 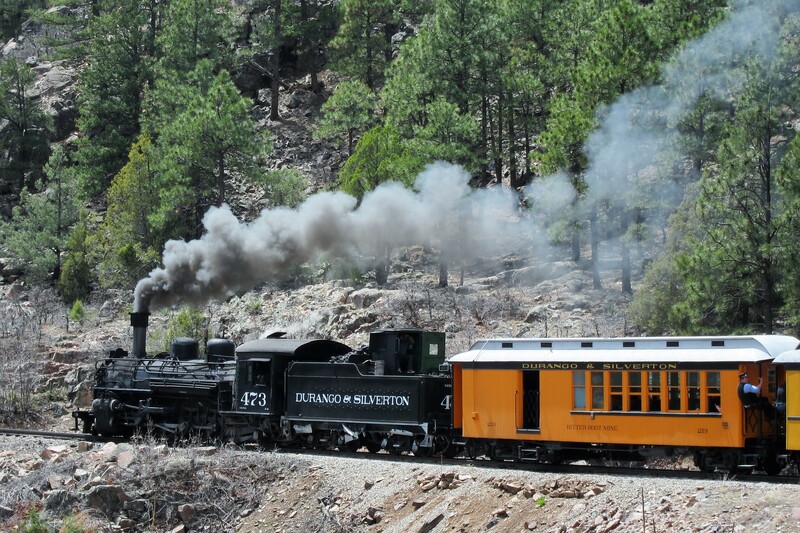 However, the crown jewel of the area is the Durango and Silverton Narrow Gauge Railway. 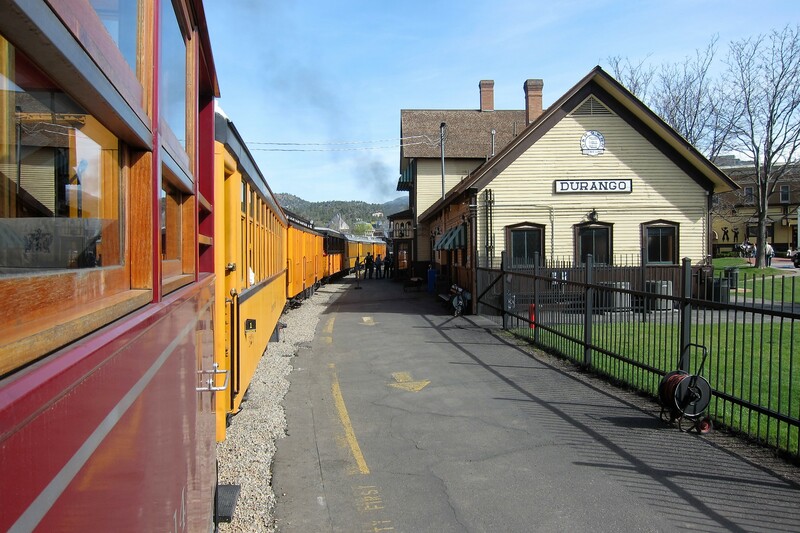 Currently an excursion train which finds its pedigree in the railroad that serviced Durango in the late 1880’s, the historic line has been in continuous operation since 1881…amongst the longest serving rail lines in the United States. 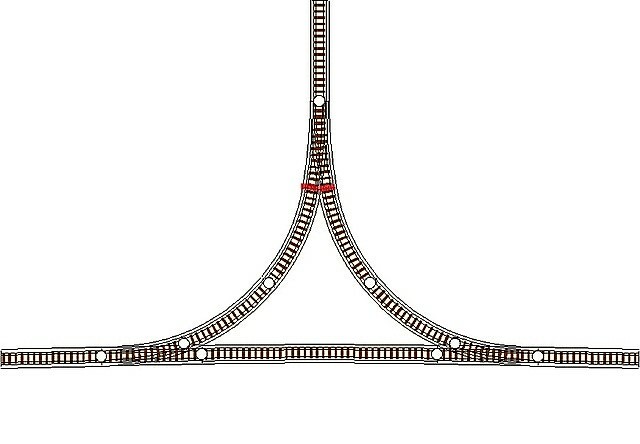 The term “narrow gauge” refers to the width of the rails, and of course the track of the wheels. At three feet in width the narrow gauge system is less expensive to build and allows for tighter radius turns in rugged terrain. Legend has it that the dimensions of three feet were chosen as that was the standard track width of Roman Chariots…hopefully Jeff will let us know if that is true? Making reservations for a Friday excursion, Kit and I arrived at the terminal an hour before our scheduled departure time on a beautiful bright spring day. While Kit browsed the gift shop, I set out to watch our train come together. The steam engine selected to pull our train was built in 1923 and is one of four restored locomotives used on the line. Each night the engine is decoupled from the rest of the train and put into a roundhouse for a thorough inspection and maintenance by the night crew. Half the spacious roundhouse is devoted to a complete machine shop where craftsman and craftswomen manufacture the parts needed to keep these old beauties running…after all, they can’t order parts from Amazon! A true steam fired locomotive, it takes tons of coal to stoke the boilers firebox and create the steam to power the pistons that turn the wheels. 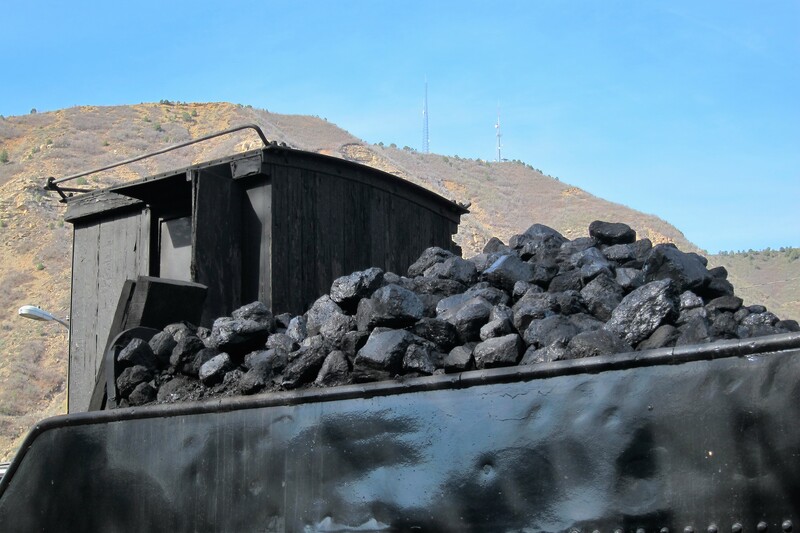 During the hours long trip, all this coal is shoveled by hand by one man…and a burly fellow he was! Soon the call “All Aboard” was heard and we found our way to the passenger car seats we had reserved online the night before. Most of the rolling stock on today’s train is vintage equipment with period furnishings. But in a nod to the modern passenger’s expectations, a few cars were newer and built for comfort and visibility of the countryside like the Silver Star…the car we choose to experience our ride on. In addition to the glass ceiling, our car was equipped with comfortable seats repurposed from an airliner, complete with tray tables! Soon we were rolling away from the station at a slow pace as the long train maneuvered through the streets of downtown Durango. 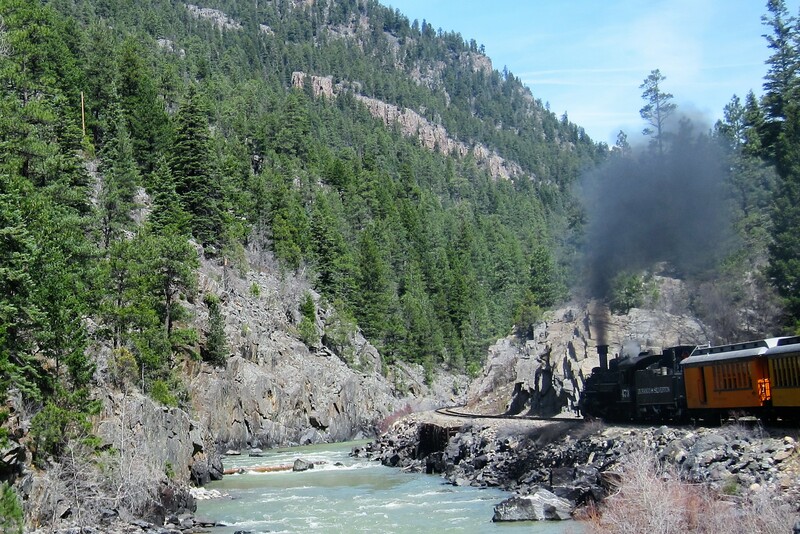 Leaving the town limits, the train picked up speed as it paralleled the Animas River and began to steadily climb into the San Juan Mountains. When the grade became particularly steep, the Firemen poured on the coal as the Engineer pushed the throttle forward and the mighty steam engine responded with a roar of belching smoke. 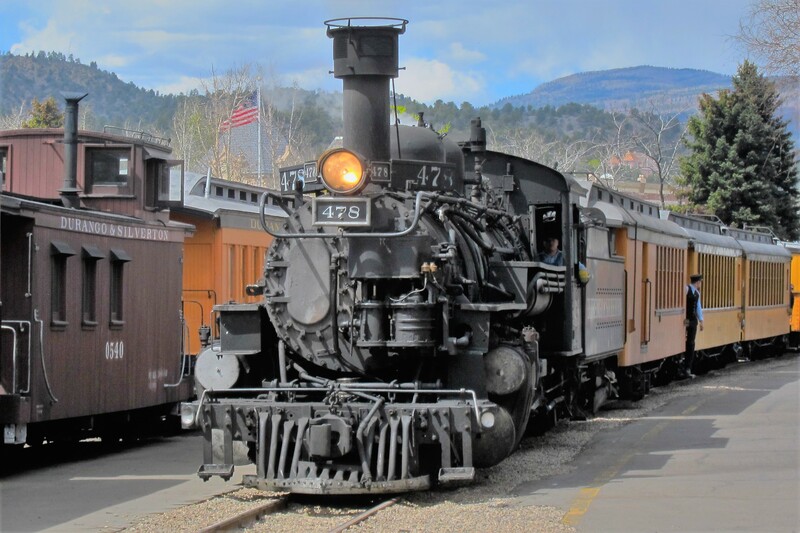 It is easy to be taken back to the golden age of rail travel with the chugging of the engine, the shrill of the whistle, the clickety-click of the rails and the creaking of the vintage cars…truly an awesome experience! 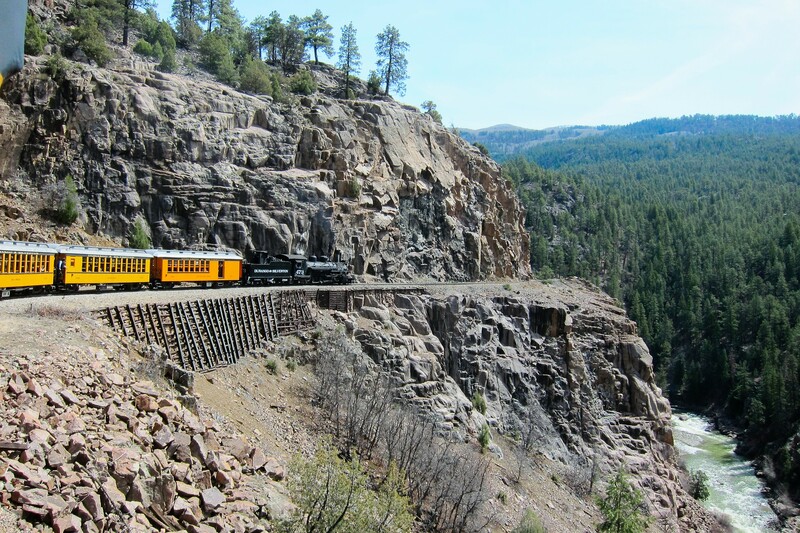 Even though the passenger car we were riding in was toward the rear, photos of the front part of the train are possible due to the many curves and switchbacks that were needed to negotiate the steep terrain. This narrow gauge track was laid out in the 1870’s and the work necessary to cut into the hillside and lay the rails must have been substantial. 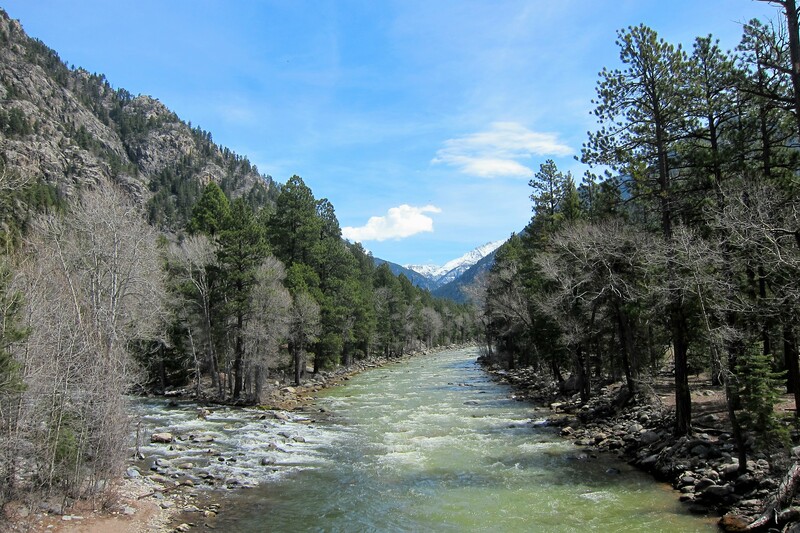 For the entire journey, we were in sight of the Animas River because if water can flow down the valley, then it stood to reason by the designers of the railroad that a train should be able to follow the same contours and make tracks up the valley. 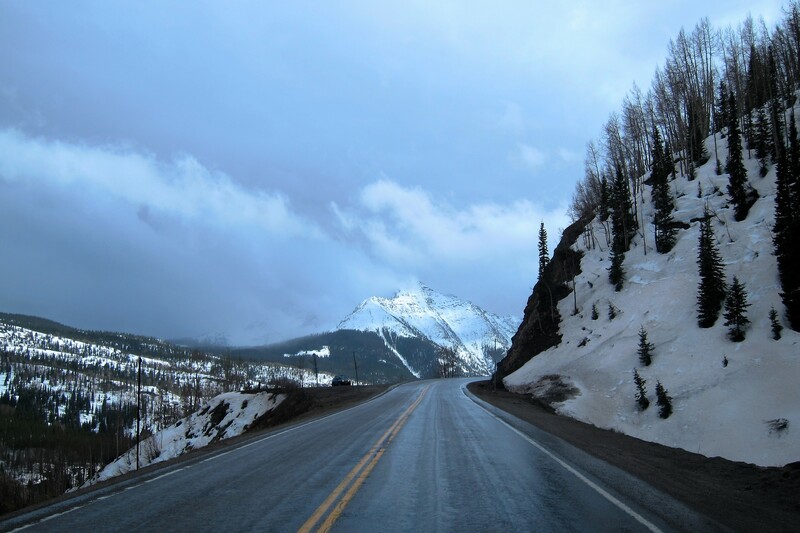 During the summer months, this excursion goes all the way to the mountain town of Silverton. 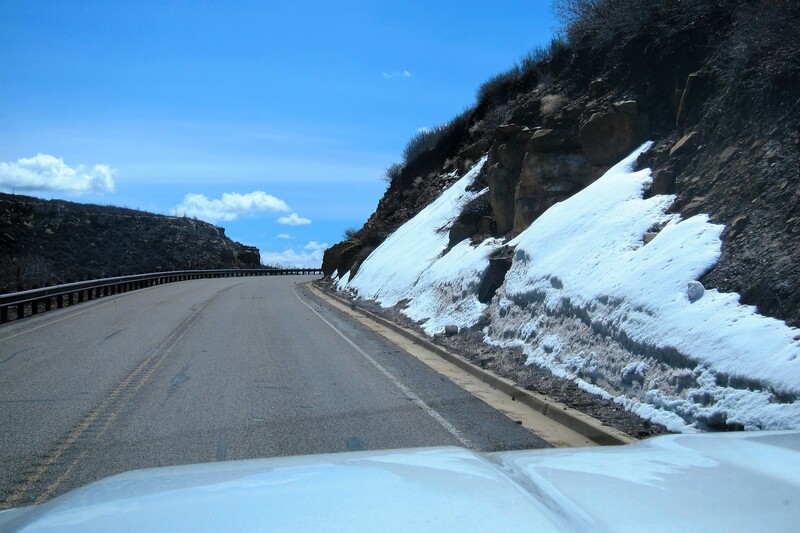 However, at this time of year, the tracks up canyon are still covered in snow and avalanche danger is a concern. So today, our tour destination was a clearing called Cascade Meadow where the train had to turn around. So how does one accomplish that in a relatively narrow valley? Actually the how is a why…make that a Rail Wye!! Kind of a three-point U-turn for trains. Below you see the brakeman who stepped off the slowly moving train to throw the switch that will allow the train to back up on the spur rail. After the train was maneuvered 180 degrees and in position to head back down the valley, we enjoyed an hour layover for some walking around time. And exploring the river up close that we had been following over the past two hours. 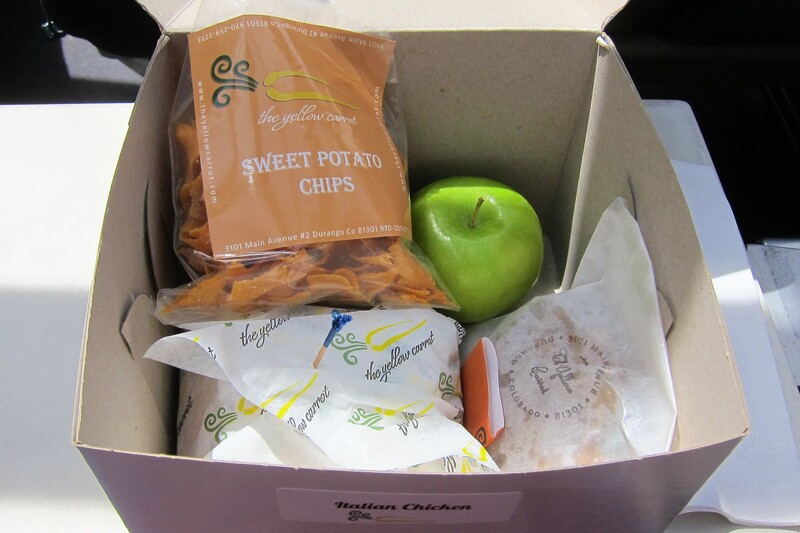 Lunch was a boxed affair from a place called The Yellow Carrot and was very tasty! Back on board and underway, we retraced our path…but due to our designated seating, and the 180-degree turnaround, were able to see a different view of the countryside. 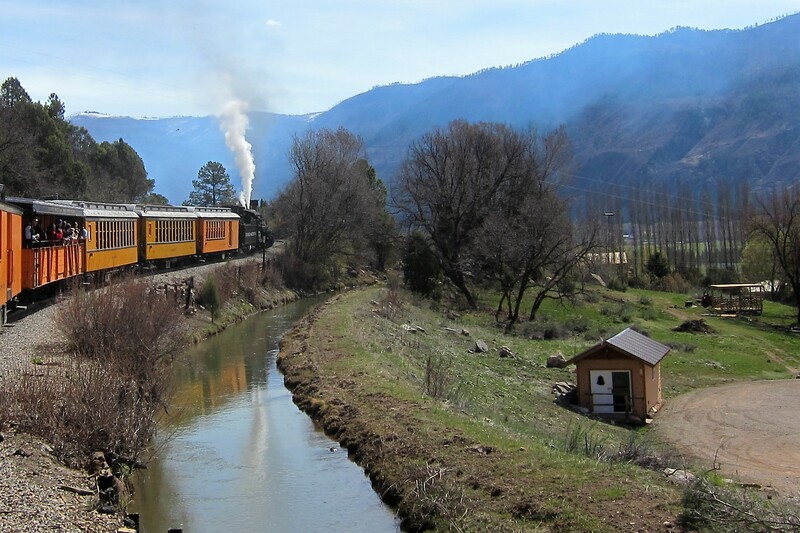 Great ride on a very historic steam train…one Kit and I would highly recommend! Back at camp, it was another quiet evening as we dropped off to a sound sleep listening to the nearby Animas River burbling along. On Saturday, Kit and I decided to drive up to Silverton since the train couldn’t take us that far. As we topped out at 10,500 feet we quickly understood why. Not evident in the photo above, but it was snowing…at times pretty hard! 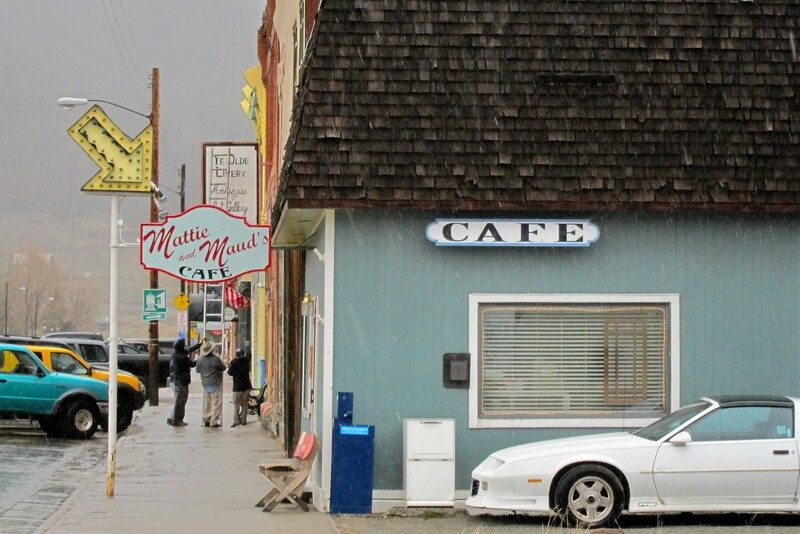 There are 655 hardy folks that live year-round in the 9,308-foot elevation town of Silverton… amongst the highest year around inhabited villages in the US. Being off season, many places were closed or on a winter schedule. However, Kit and I were able to browse around some very interesting shops full of antiques from Silverton’s golden, and silverton (pun intended), past. You see, the town was established around a large gold and silver strike in the 1800’s, which is why a train track was proposed up into this mountainous terrain. 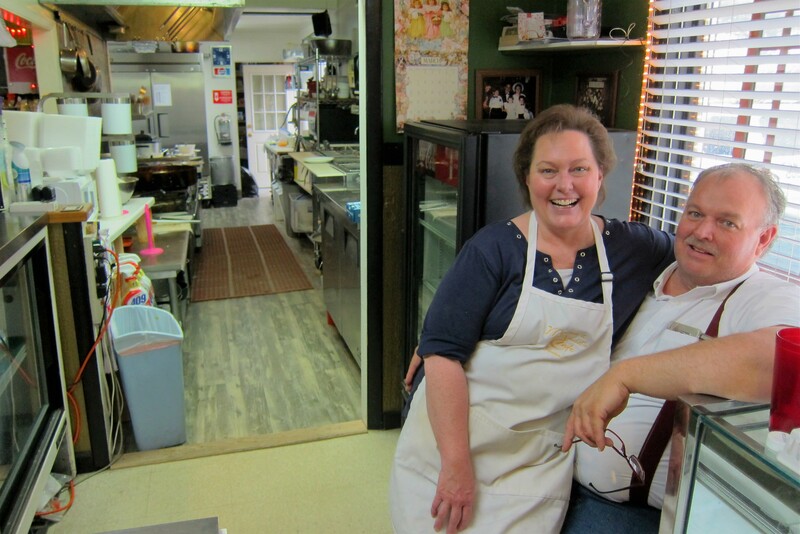 Asking around town about a great place to eat, we were unanimously referred to Mattie and Maud’s Café. Even though they were near closing time, the owners graciously invited us in and served us an excellent meal…as they did a few other travelers that came in later. 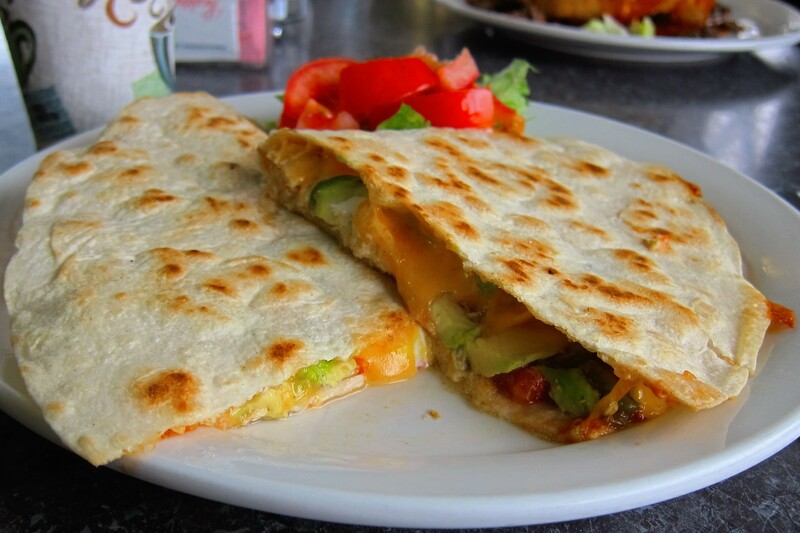 The quesadilla was some of the best I’ve enjoyed! And the owners Spike and Lori visited with us for quite a spell, even though they had been at their restaurant since 5:30AM! Just before we left, the sheriff popped in for a snack and let us know that the roads back to Durango were wet from the snowfall but passable. Gotta love small town America! The trip back to our campsite was challenging, but fortunately uneventful. Safely in our camper and with full bellies from the excellent meal in Silverton, Kit and I enjoyed a few snacks and an evening cocktail before calling it a night. Tomorrow is another day, and another adventure…so please stay tuned! Kit’s Bit’s: This has been a neat part of our trip! 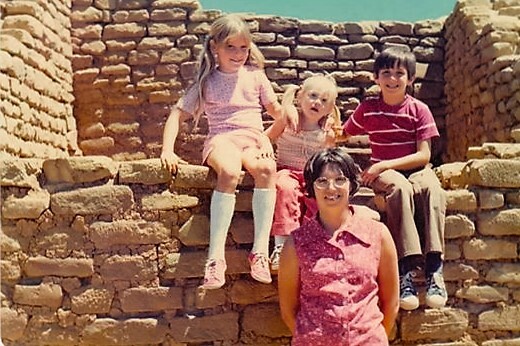 First, we “retraced” steps from our earlier trip, back in 1974 with the kids. Second, we were finally able to meet up with Larry and meet his wife, Vikki. And, third, during our time in Cortez and Durango, we had such a wide range of temperatures. Nice and warm, up to 80 degrees down to snow and 30 degrees. Good thing we have a few clothes for each season! We had to use our down jackets, scarves and gloves for a while. I opted out of the two tours Bill took in Mesa Verde NP because I knew I would be too scared. Instead, I used the time to walk about the area and do a few household chores. All in all, we enjoyed our time in this area. Thanks so much for letting me travel with you. I always enjoy the trip you take us on. What an adventure, maybe one of the most interesting of all. The cliff dwellers were quite the engineers in their own right! 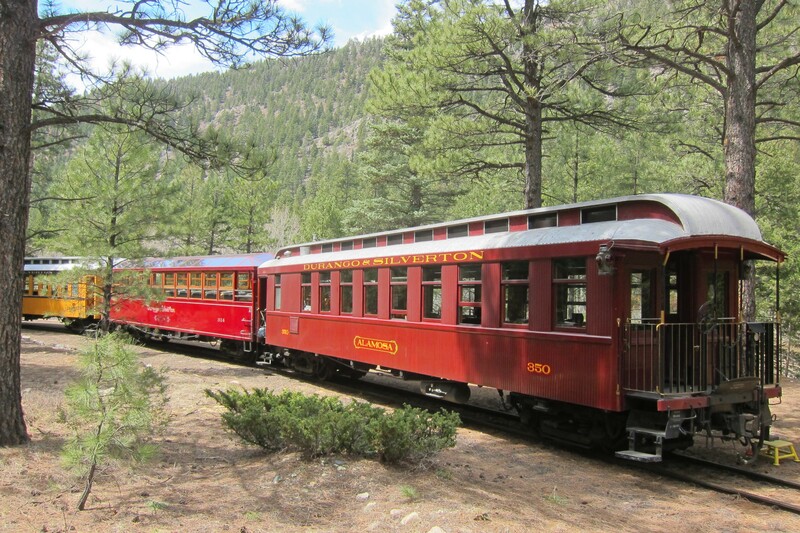 The segment on the Durango narrow gauge RR was very interesting to me, as we had a narrow gauge. that ran through the town of Whitefield, Me directly over the banking from our farm house located on Rt. 194. where I grew up. There is now a narrow gauge museum located in the town of Alna, Maine on Rt. 218. we have made a couple of donations to the RR and have had the pleasure of being invited to take a free ride on their few miles of restored RR bed. The RR yard started at Wiscasset and terminated in Farmington, Me. The final run for the RR ended up wrecked on the banks of the Sheepscot River in 1933/34 a short distance from our farm. As a youngster around the 1940s, I can recollect finding large steel plates and spikes along the old RR bed. The tracks had been previously removed to provide steel for the WW2 effort. This Restored Station and all the engines and passenger cars were made possible from private donations of labor and materials. 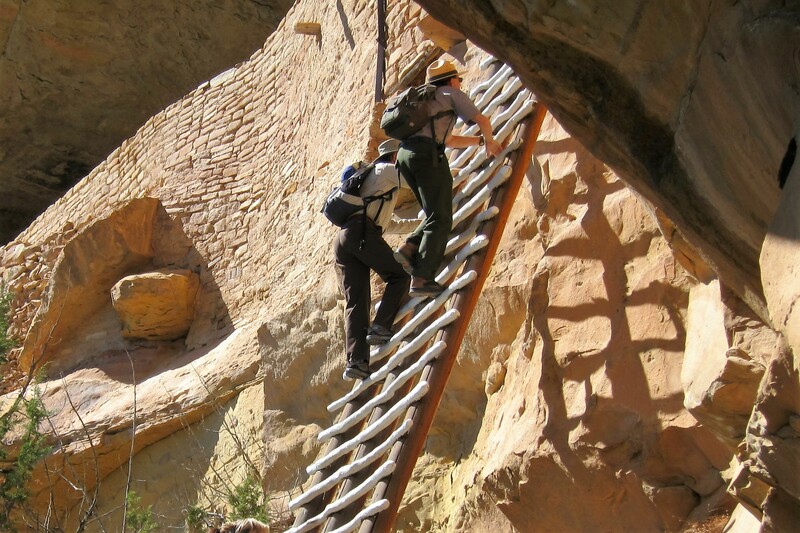 Sure do enjoy your fine photography and travel patter….we have been to Mesa Verde National Park several times over the years….and truly enjoyed it all…though we did not take the ladder tours. 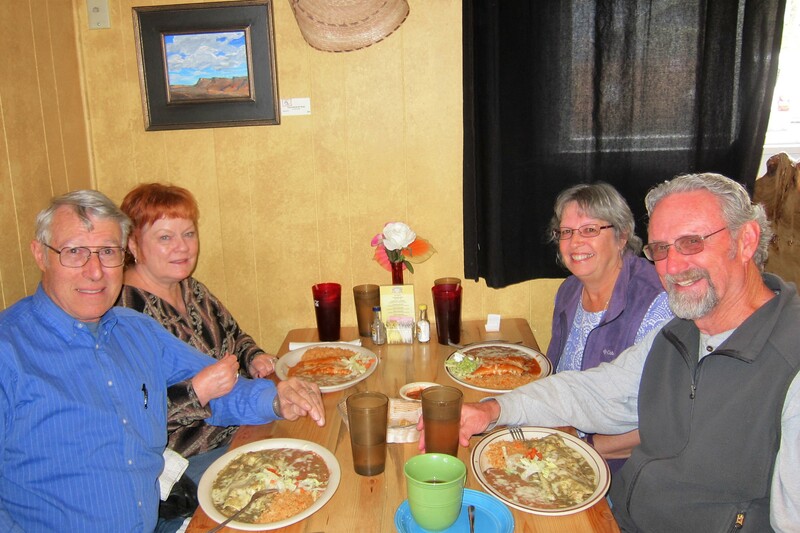 We have a couple from Snowbird Mesa camp hosting out of Sisters Oregon now, who came from Durango….have family there. Keep on truckin’ you are doing a great job on the narrative….Kit you were wise not to be trying those high ladders….I don’t do that either! 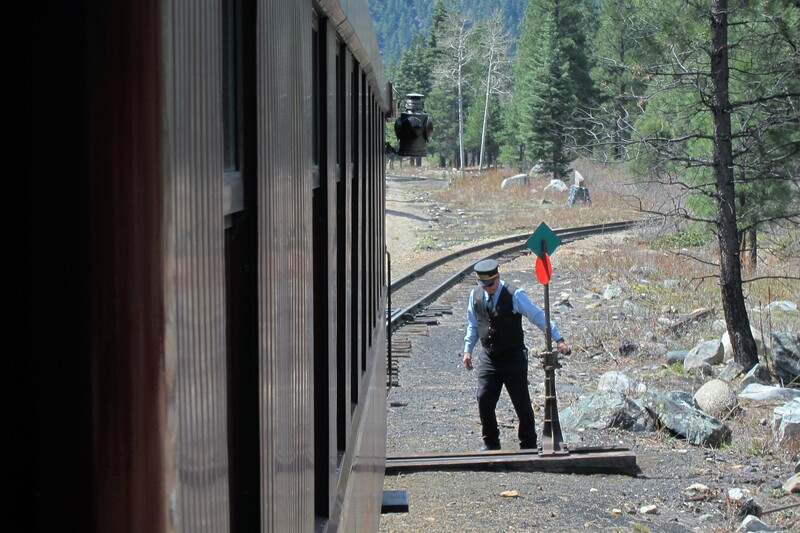 We have ridden on the narrow gauge railroad Portland. There was talk of relocating it so I don’t know if it is still there. Very interesting. I have always LOVED train travel and did a lot of it as a kid. Your photography is wonderful and you have shown us many beautiful places. 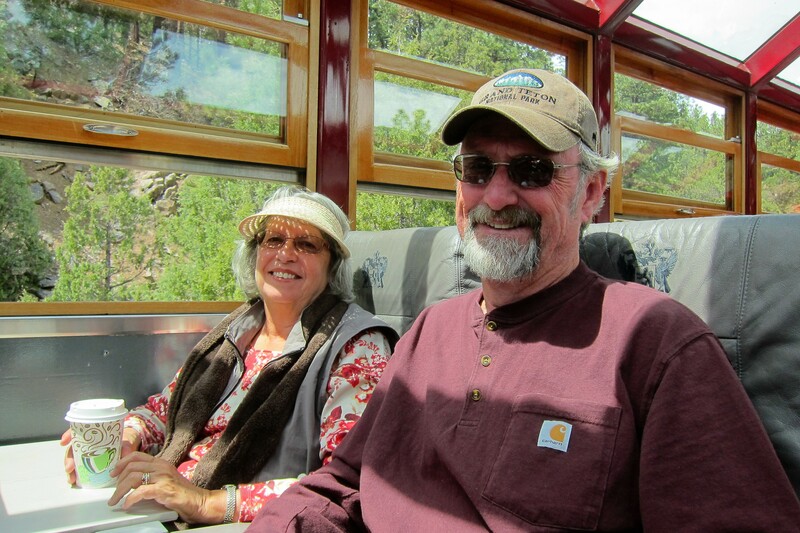 We SO enjoyed your photos, Bill, of the tours into the cliff dwellings of Mesa Verde and your explanatory verbiage. What a wonderful place to visit! Well “Bull” another great journal. 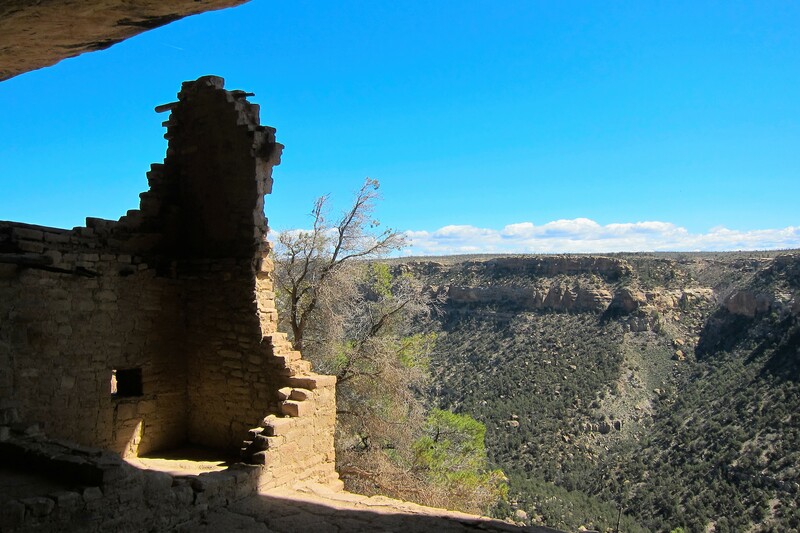 Mesa Verde National Park was very interesting and reminded me of ruins in Cottonwood, Az. 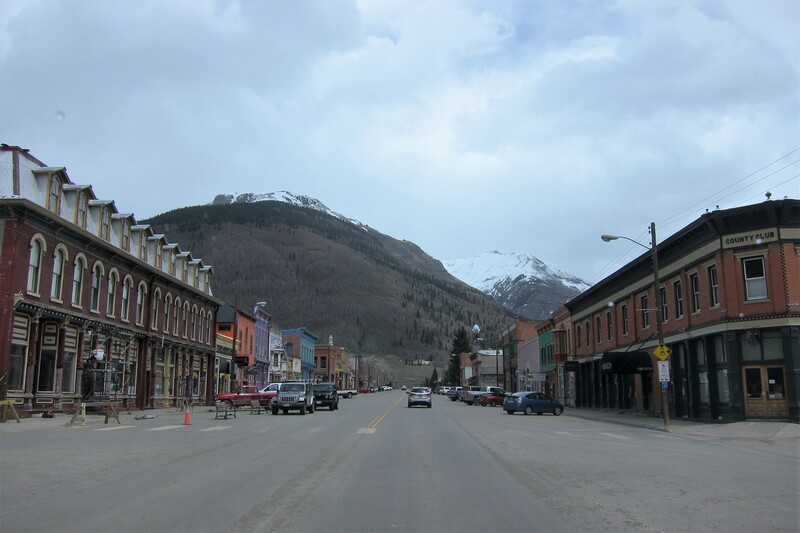 Durango and Silverton were gorgeous…Very quaint! That was great you got to travel the same route you took in ’74 with your kids…..what memories that must have conjured up! Kathy…good call on not doing that vertical climb! I imagine a few Ancient Puebloans lost their footing on those rock walls!